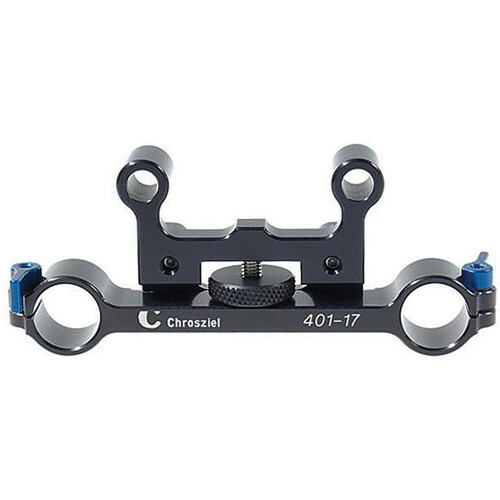 The Chrosziel 401-17 is a center mounted, 19mm to 15mm rod adapter for their bridge plates. The adapter uses a screw on fastener and is adjustable both horizontally and vertically. Box Dimensions (LxWxH) 5.5 x 2.0 x 1.0"
401-17 15mm to 19mm Bridge Plate Adapter is rated 5.0 out of 5 by 1. Rated 5 out of 5 by Jrosen from Great! This adapter is very well crafted and heavy duty anodized steel. Great accessory to have to easily switch from 15mm LW to 19mm studio.